This stylish on-trend 4-pc cookware set, with colourful rims, will be an eye catcher on every stove. 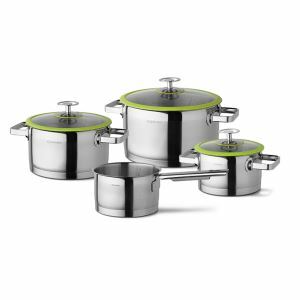 Cuisinox 4-pc cookware set Ø16 + Ø16 + Ø20 + Ø24cm. High polished 18/10 stainless steel, scratch-resistant. Ergonomically shaped stainless steel handles for a firm grip. Optimal heat distribution over the entire ssurface. Including measurement scale and steam hole.